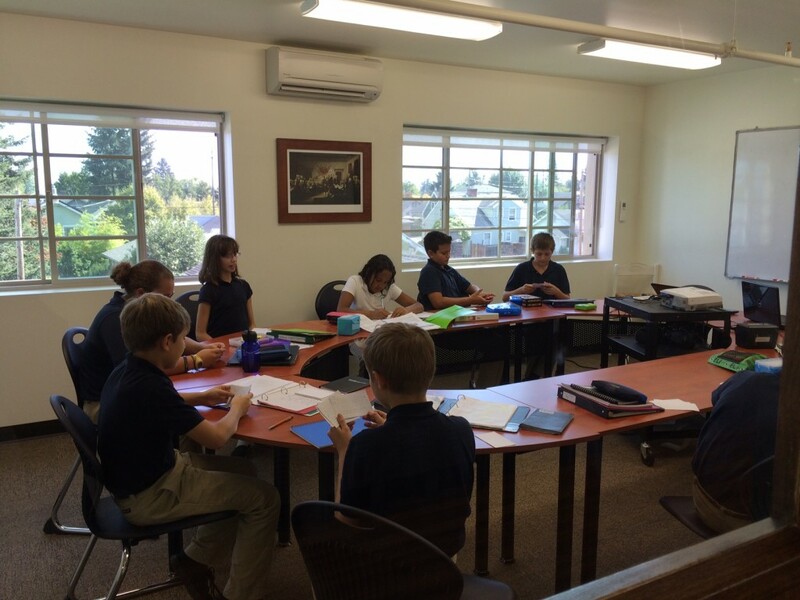 Trinity Academy started its fourth academic year in a new location in north Portland. Story by Chris Meehan. Photos by Ekko Designs and Beth Kabele. Trinity Academy in Portland has moved into a larger building after almost tripling in size since last year. The school, now in its fourth year of operation, has 45 students in the sixth through twelfth grades, up from 16 students in 2013-14. Twelve of these students are the children of community members, while the remaining 33 come from non-community families. The growth has beaten the Vancouver/Portland branch's expectations. "We had projected that it would take 10 years to reach an enrollment of 30 students," says Charlie Fraga, who heads the branch and chairs the school's board. "We're very happy about the growth, and also extremely grateful to our good friend Haddish Tarekegn, a local Christian businessman, who made it possible for us to have a building with enough room for all of the students. Haddish first heard about the young school and its need for space after a child's birthday party at Pat and Jo Clark's home. He offered to renovate a three-story, 10,000 square-foot building he owns in north Portland, in the same section of town that the branch has targeted for their city-building efforts. Haddish and his wife Rahel Legese, both native-born Ethiopians, send their two young daughters to Holy Redeemer School, where several families in the branch also send their children. Haddish is the owner of Pristine Cleaning, a company which has a number of stores, offices and hotels in the Portland area as clients. He also invests in local property. The renovation took over a year and included the creation of numerous classrooms, a faculty room, open space for morning prayer and assemblies, a basketball court, a courtyard where students can eat lunch during warmer months, a new exterior facade and a major structural upgrade to reinforce the building against earthquakes. Trinity Academy now occupies the top story and part of the second story, which also houses Direct Development, a marketing company Charlie runs, and the Vancouver/Portland branch office. The offices can eventually move down to the first story to accommodate any future growth of the school. The school has signed a five-year lease. Head of school Jo Clark says branch members have been crucial to the school's strong start. "In addition to prayers, excitement, enthusiasm and encouragement they have provided service-helping us move into our new building-and ongoing volunteer support. They have filled the seats at school events and they serve on the school's advisory council." She notes that the five seniors at the school are "the kind of senior class any school would cherish." All five of these student pioneers-four of them children of community members-have attended the school since its first year: Christian Barajas, Carlos Castro, Peter Kabele, Stephen Kabele and Naomi Shreves. "The seniors are stalwart leaders," says Jo, "a delight to teach and great role models for the younger students." The sixth-graders enjoy their Public Performance class taught by Dr. Francie Longshore. Some of the growth in enrollment occurred because Trinity Academy added a sixth grade this year. This was in response to parents' requests, since many local grade schools stop at fifth grade. Word of mouth accomplished the rest, and Eric Shreves, chair of the advisory council, credits branch members and current students' parents with getting the word out. "The result is a diverse student body with many denominations and ethnic groups represented," he says. Jo says the faculty has played a big role as well. "I tell prospective parents that our teachers are very knowledgeable, wise and kind. 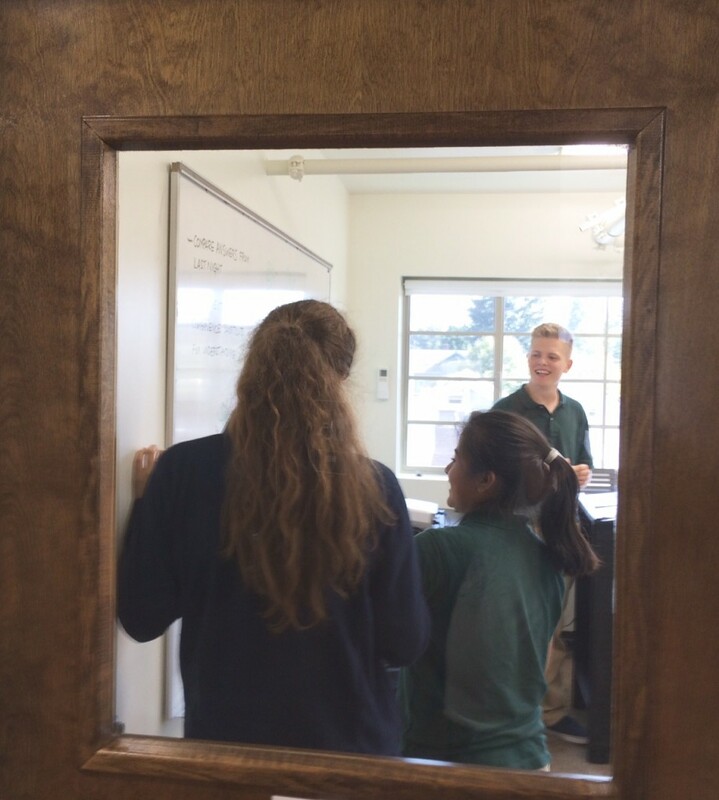 This fall we have a great crop of new teachers who bring a lot of enthusiasm to the school and are proving to be exceptionally good at drawing out a sense of wonder in our students." Among the new teachers is Sam Mertz, a graduate of Trinity at River Ridge, who recently completed his history degree at Holy Cross College in South Bend. Martha Olson, a Trinity School at River Ridge grad, teaches part-time. The school has four full-time and 12 part-time teachers, including six community members. As a member of the admissions committee, Charlie meets with most prospective students and their families. "I'm impressed with how sincere these parents are about raising their children in the best possible Christian and academic environment. They sense that Trinity Academy is what they've been searching for, and several have told me that they have never seen their child so happy at school before. A lot of that is due to Jo Clark who has worked indefatigably, doing whatever it takes to get this school off the ground. She has an obvious love for the school and for the students themselves." This story is awesome! How exciting it is that the Lord always exceeds our expectations! My family is part of the Evansville P.O.P and it will be a day of victory and rejoicing to see a branch and a Trinity school here in the future. Looking forward, moving forward! Such exciting news! Praise God. Very hopeful for future growth! Praise God for the generosity of Haddish and his wife, for the generosity of time spent by faculty, and students and everyone else who helped with the new school. I'm so excited about this and impressed at how the school has grown so quickly. What an inspiration you are for the rest of us and it's easy to see that God is blessing all of your efforts! Praise Him! It is a beautiful school. When Tom and I were in Portland this summer on vacation, we were lucky enough to take a tour of the building. You can tell how dedicated the community is to its growth and how God is blessing this Trinity Academy! I happened to be visiting the Portland/Vancouver branch when the renovation of this building was just beginning. I only saw the exterior. What a makeover! What a handsome building! Awesome! This is a great work of the Holy Spirit and His People. Glory be to God! Good work Vancouver/Portland! That is indeed a GREAT story! Look what the Lord has done! I am brought to tears of joy on behalf of all of us in POP. This is a wonderful victory! I am inspired and look forward to hearing more of the exciting things going on at Trinity Academy. Hats off to "Dr. Mom" (Jo Clark). You are a force to be reckoned with! Congratulations Trinity Academy! How good to hear of your growth! Thank you to all who have sacrificed and dedicated your life to this endeavor! Glory to God!! I was taken back when I saw the appearance of the building in the photo. Thank you, Mr. and Mrs. Tarekegn. What a gift! Congratulations to the Vancouver / Portland Branch for your diligence in getting Trinity Academy off the ground. There is no turning back now. Bravo!!!!!!!!!!!! Thank you for all your hard work for the Lord! All your prayers built that beautiful building. It's an obvious sign of God's work in building a new generation of Christians. Thanks to Haddish Tarekegn for envisioning the future. That's actually geometry, not Ninth Grade Humane Letters. Jack is a sophomore. John and I are the parents of Pat Clark, the in-laws of Jo Clark and PopPop & Nana to Addie, Lia and Nora Clark. It has been our pleasure to watch the development of Trinity Academy from its humble beginnings. We remember that when Pat & Jo moved from northern Virginia to Vancouver/Portland the possibility of starting a Trinity school was just that . . . a possibility. Oh, what the Lord can do with our dreams when they are in alignment with His will! Congratulations to everyone who helped make this a reality, especially to our dear "daughter!" Very spectacular! How great to fully appreciate the Lord's blessings for the Portland/Vancouver branch! I've known Haddish Tarekegn for 26 years and I am very happy for his success. His success is not by accident. He is a hard worker, compassionate, honest, respectful, responsible man and loves what he does. If you have an opportunity to do any business with him, go for it!